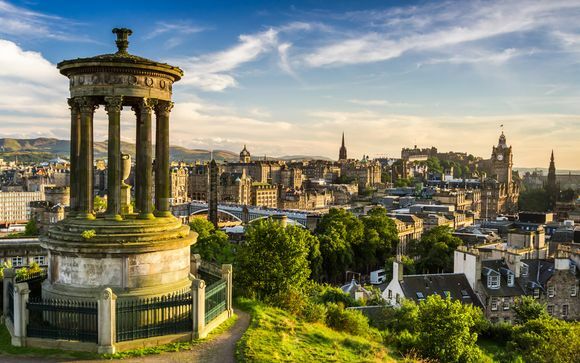 Discover Edinburgh, take in the ethereal and dramatic landscapes of the Scottish Highlands and unearth the mysteries of the magical Isle of Skye with its outstanding natural beauty, Viking history, and ancient myths and legends. Embark on a seven-night tour including stays in 3 and 4* hotels across Balmacara, Aberdeen and Edinburgh. Our members will have included car hire services and will become the captains of their very own voyage around the Scottish Highlands! From the New town adjacent to Princes Street to the quirkiness of the Old Town starting at the Royal Mile - both jointly listed as a UNESCO World Heritage Site. 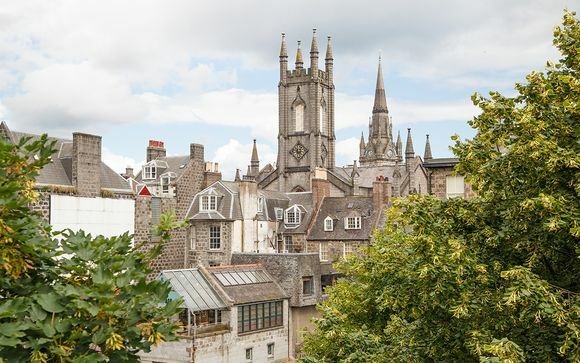 You can enjoy boutique shopping in Multrees Walk and a wide choice of restaurants and bars in the West End - or visit the once famous medieval market square at the Grassmarket, which also offers splendid views of the Edinburgh Castle. 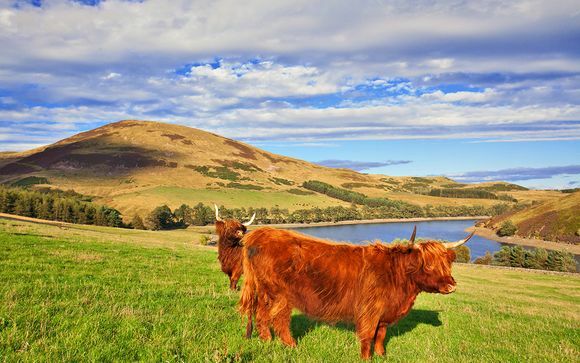 Expanding two-thirds of Scotland, the Highlands region is an unspoilt wilderness of spectacular beauty, famous for its passionate, fiery-haired folk, rugged Highland cattle, and world-famous whiskey. Explore the stunning mountains of the region plummeting into the lochs below and the rolling glens as the sun sets in the distance. Hike deep into these remote landscapes and see if you can spot a wild deer. Visit one of the many whiskey distilleries to learn how they make their fine brews and sample some of their best. Taste some of their own Scottish smoked salmon in a local smokery and try your hand at some fishing in their wild rivers. Listen to the bagpipes play in the local town and soak up the atmosphere of a country filled with spirit and an unforgotten, passionate history. 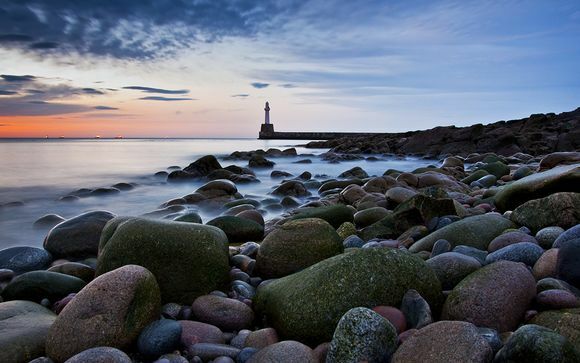 Fueled by a burgeoning cultural scene along with an influx of luxurious development, Aberdeen has established itself as the powerhouse of Northeast Scotland and a thriving cosmopolitan centre in the north. Aberdeen derives its nickname as the 'granite city' from its silvery-grey architecture and design, thus attributing an attractive and mysterious gleam to the city. From its cultural and historical landmarks, such as the Maritime Museum, the Aberdeen Art Gallery, the abandoned Rubislaw Quarry; to its proximity to royal icons such as Royal Deeside to the West, and Dunnottar Castle to the south, this is a windswept and history-filled must-see metropolis. With its name originating in Old Norse and translating to 'Cloud Island', this Viking Island must be seen to be believed. Its beguiling terrain, mist-enshrouded hills, and mossy green fields will enchant you. The area is one of Europe's wildest, most romantic and most scenic lands. The Isle of Skye is a picturesque and hauntingly beautiful place to admire nature's awesome imagination as the ever-changing mists and seasons roll in from the Atlantic. Jagged snow-capped peaks, brooding mountains, endless moorlands, vast sea cliffs, beaches, castles are all laid out against the mists and the oceans to form the most wonderful panoramas. On arrival at Edinburgh Airport, please make your way to the rent-a-car desk where you will be provided with the keys and documentation for your trip. Drive to Edinburgh. From here you can visit top sites throughout the city. Edinburgh is one of the most charming cities in Europe. Divided by the districts of The Old Town (old city) and The New Town (new city) considered World Heritage in 1995. Discover medieval, Georgian and modernist architecture and an old town full of narrow cobbled streets, where it is always a pleasure be lost. Our members will enjoy this city as it is characterised by dynamism and cultural. Accommodation in the hotel in Edinburgh. Breakfast in hotel. 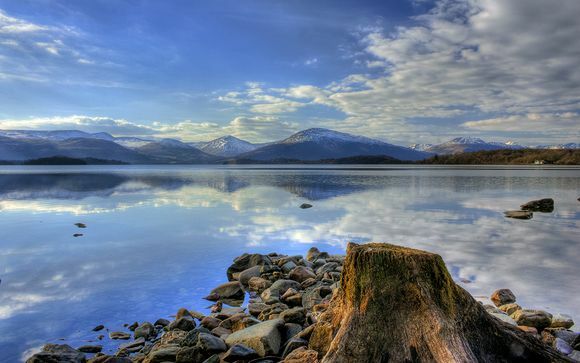 Enjoy some of the great outdoors with a visit to the country's national parks: Loch Lomond and The Trossach, a mountain range that is the prelude to the Highlands region. Walk the shores of Lake Lomond, before relaxing in Lake Katrine, or head for a visit of Fort William, located in the shadow of Ben Nevis. Once you reach Balmacara, you can unwind in your hotel and relax after a full day of exploring. Accommodation and dinner (included) in the hotel in Balmacara. Breakfast at the hotel. Enjoy your free time. You may choose from our suggested activities*. After breakfast in the hotel, start your day by enjoying the city of Inverness, the capital of the Highlands region and located at the mouth of the River Ness in the Moray Fjord. After visiting the city, you can make your way to Aberdeen by crossing the Cairngorms National Park, a fantastic area where you will find mountains, forest paths, rivers, lochs, wildlife hotspots, friendly villages, and distilleries. 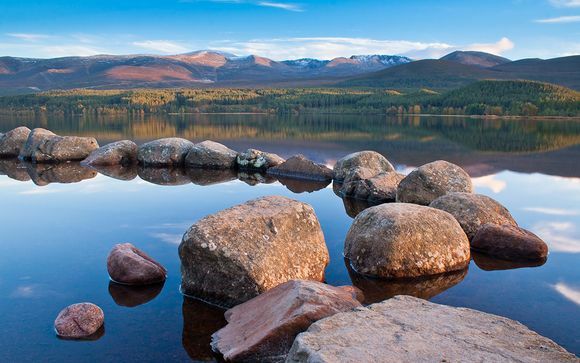 In Cairngorms Park, you may enjoy some of our many different suggested activities*. Once you arrive in Aberdeen, you will check in at your hotel and enjoy the city until dinner. Accommodation and dinner (included) in the hotel in Aberdeen. Depart Start your day with breakfast. If you have enough time before your flight, visit more top sites in the city or spend a few hours shopping. You will return the car before or at the same time of pick up on your first day to avoid the extra charge. Our members will stay at the following accommodation (or similar) with this offer. With its central location, Motel One Edinburgh-Royal is the perfect three-star hotel for exploring the city on foot. Guests staying here will enjoy designer features, cosy rooms and will love being in the Old Town, just a few blocks away from the illustrious Royal Mile. Stay within a 10-minute walk of Edinburgh Zoo at The Torfin Hotel, and enjoy a number of amenities including a terrace and a bar. 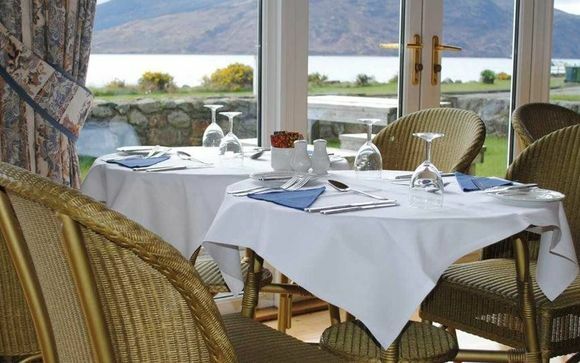 The Balmarca Hotel is a waterfront and contemporary 3* hotel on the shores of Loch Alsh. 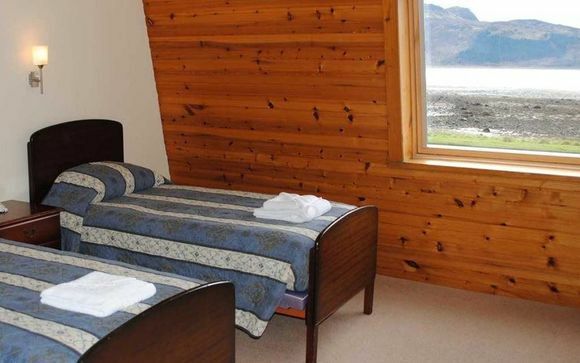 This quaint yet refined property enjoys great views of the Isle of Skye. Your room comes equipped with a kettle, wifi, TV, and a private bathroom fitted with a bathroom or shower. 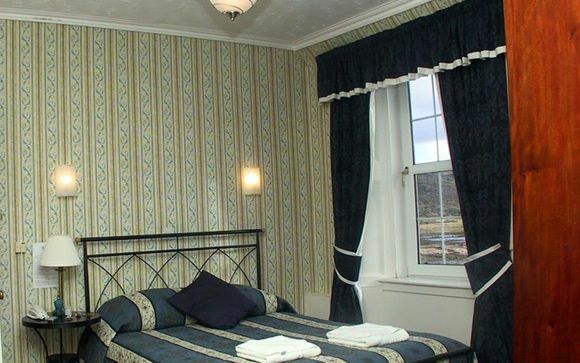 You will feel at ease with the comfortable and elegant decor that provides cosy and authentically Scottish ambience. 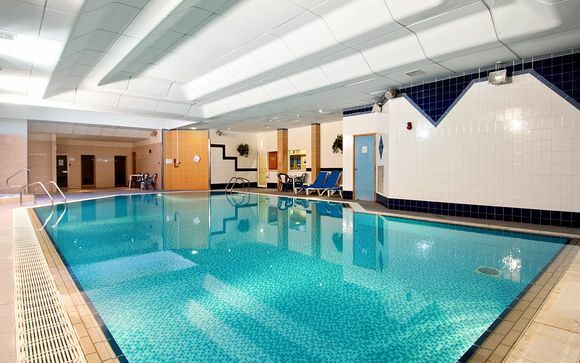 Just a few minute's walk from the windswept beaches and 900 yards from the centre of Aberdeen is the 4* Doubletree by Hilton Aberdeen City Centre. This classical hotel features bright and spacious bedrooms and a restaurant serving a creative modern menu using quality local produce. Here you will also find a Conservatory, offering hearty breakfasts and evening meals, while The Atrium serves traditional pub-style favourites. 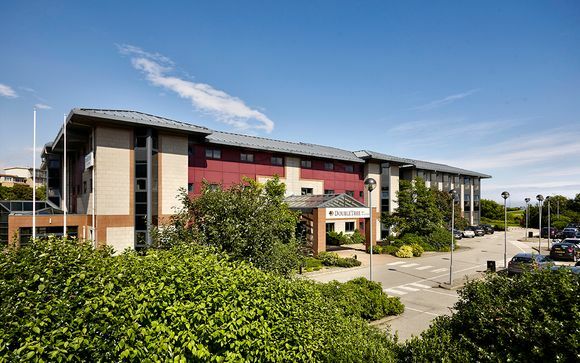 With its close proximity to the beach, city centre, and numerous world-renowned golf clubs, the DoubleTree by Hilton Aberdeen City Centre is a convenient and trustworthy accommodation in Aberdeen. Please note: bookings for 3 passengers will be in a Double Room and Single Room.The bed for the 3rd/4th guest sharing is likely to be a sofa bed or camp style bed. If any of these hotels are not available, hotels of a similar standard will be found. Aberdeen City is brimming with cultural and historical landmarks. We suggest you visit some of its most popular attractions, including St. Machar Cathedral, Seaton Park, Brig O' Balgownie, Old Aberdeen, Aberdeen Bach, and King's College, University of Aberdeen. 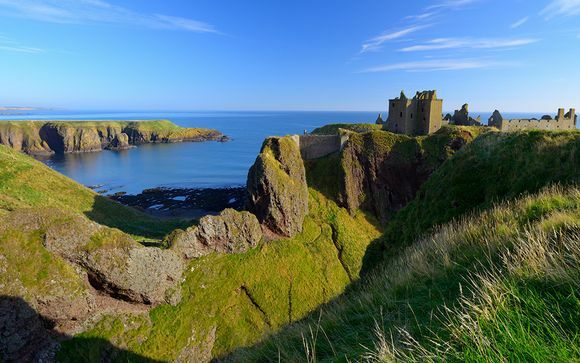 Visit Dunnottar Castle for an unforgettable experience and discover the importance of Dunnottar – an impregnable fortress that holds many rich secrets of Scotland’s colourful past. The dramatic and evocative ruined cliff top fortress was the home of the Earls Marischal, once one of the most powerful families in the land. This national park has something for everyone, from castles and distilleries to quad bike trails and opportunities for extreme sports. Balmoral Castle has been the Scottish home of the Royal Family since it was purchased for Queen Victoria by Prince Albert in 1852, having been first leased in 1848. The Castle is an example of Scots Baronial architecture and is classified by Historic Scotland as a category A listed building. Loch Muick is located 8 miles south west of Ballater in Aberdeenshire and found at the foot of Lochnagar, one of Scotland’s finest mountains. The area has many walking routes and a variety of wildlife including grouse and deer. In this area, you may find some as Royal Lochnagar Distillery & Visitors Centre and The Glenlivet Distillery amongst many others. We suggest you explore the Isle of Skye where you will find one of Scotland's most beautiful and fascinating landscapes. Of all the Inner Hebrides, Skye is the most visited island because of its incredible views, rich heritage originating in the clan age, its prevailing Celtic traditions, and for its abundant wildlife. Without any doubt, today you’ll make a trip that you will never forget. Embark on a horseback ride or cycle trip, or hire a kayak to admire this scenery from a different perspective. The main town of Skye, overlooking a bay, is famous for its charming harbour with beautiful houses and colour facades. An interesting tourist and commercial centre, Portree will charm you. Visit the numerous art galleries and craft stores for a handmade souvenir. As one of the most iconic images of Scotland, Eilean Donan is recognised all around the world. Situated on an island at the point where three great sea lochs meet and surrounded by some majestic scenery, it is little wonder that the castle is now one of the most visited and important attractions in the Scottish highlands. We recommend you hire a bike to get around the island of Skye. Challenge yourself with its hilly terrain and invigorating mists. Book this activity at your hotel. If conditions permit, enjoy a light hiking route to take in the magnificent views and epic landscapes of the Isle of Skye. 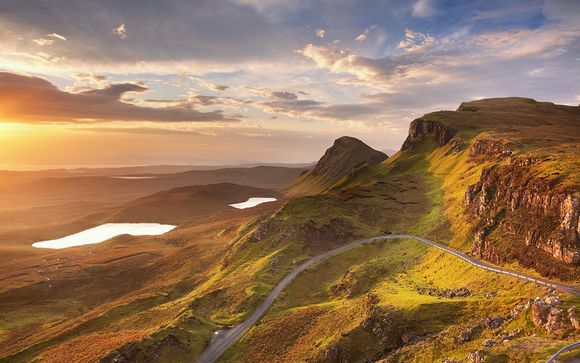 Pass by the Quiraing with its incredible interior plateau, or visit the Old Man of Storr with its huge pinnacles of rock rising from the earth. 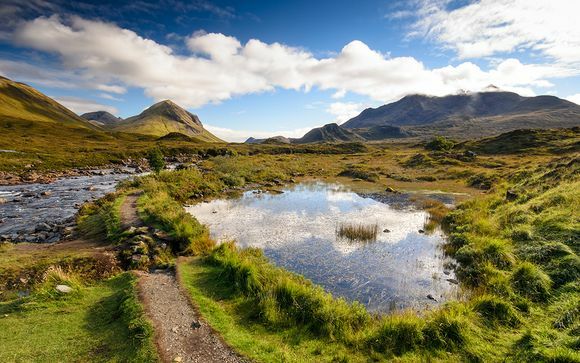 Skye has hundreds of walks varying in terrain and difficulty to suit all travellers. These tours enjoy regular sightings of Whales, Basking Sharks, Seals, Dolphins, Porpoises, Otters, Sea-Eagles, Puffins, and majestic Seabirds in this rich marine environment. Book this activity at your hotel. Available for guests of all skill and level, take on this landscape in a new and exciting way. Book this activity at your hotel. Hotels are subject to change based on availability, however, guests will be accommodated in hotels of a similar standard. These properties are accessible to people with reduced mobility, however, as the hotels are not set, we cannot guarantee that the hotel you will be staying in has access to people with reduced mobility.